CNN is reporting that the U.S. Embassy in Tripoli, Libya has been evacuated due to the escalating militia violence raging out of control. According to news reports, about 150 personnel, including 80 U.S. Marines were evacuated from the embassy and were driven across the border into Tunisia under the protection of F-16, MV-22 Osprey aircraft and drone patrol from above. The only option was to drive the embassy officials out as the Tripoli airport had been shut down due to the violence. The removal of the US Embassy staff took place without incident. As reported at the BBC, It is the second time in more than three years that the US has closed its embassy in Libya. The state department has also urged US nationals not to go to Libya. The U.S. Embassy in Libya evacuated its personnel on Saturday because of heavy militia violence raging in the capital, Tripoli, the State Department said. About 150 personnel, including 80 U.S. Marines were evacuated from the embassy in the early hours of Saturday morning and were driven across the border into Tunisia, U.S. officials confirm to CNN. U.S. officials stress that this is a relocation of embassy personnel and the operations have been “temporarily suspended” until “the security situation on the ground improves.” The embassy will continue to operate from other locations. A senior State Department official said some of the staff from Libya will be sent to other U.S. embassies in the region and others will come back to Washington. State Department spokeswoman Marie Harf said that security and safety are a top priority and come first. Really? Also, while there appeared to be no direct threat of an attack against the embassy, it was the rising violence in Libya between the battling factions of warlords for control that caused the evacuation. Too bad the Obama administration and State Department did not take the same precautions in Benghazi, Libya when violence was escalating and the US Ambassador Chris Stevens asked for more security. “Securing our facilities and ensuring the safety of our personnel are top Department priorities, and we did not make this decision lightly. Security has to come first. Regrettably, we had to take this step because the location of our embassy is in very close proximity to intense fighting and ongoing violence between armed Libyan factions. Militia fighting in the area of the embassy and airport has degraded security in Tripoli significantly. Secretary of State John Kerry called upon various factions to engage in a political process, saying “the current course of violence would only bring chaos.” Good grief, are you kidding? That’s the Obama’s administration’s response? So America, how that “Hopey-Changey” Barack Obama Cairo speech looking now? President Barack Obama made it one of his first priorities to head off to Cairo, Egypt and speak to the Muslim world in his so-called Cairo speech (VIDEO), calling for renewed Middle East peace talks as well as an agenda for economic and social development in the region. How naive does Obama’s Cairo speech look this morning as two US Embassy’s were attacked yesterday, one in Cairo, Egypt and the other in Libya? Especially since Ambassador Christopher Stevens and three other embassy officials were killed yesterday and the US State Department provided an apology on of all days, September 11, the 11th anniversary of 9-11. BTW, two of the Embassy staffers were US Marines. Sarah Palin weighed into the fiasco on Facebook stating, “Apparently President Obama can’t see Egypt and Libya from his house. On the anniversary of the worst terrorist attacks ever perpetrated on America, our embassy in Cairo and our consulate in Benghazi were attacked by violent Islamic mobs.” Where was Obama when all this was going on? What took so long for Obama to condemn the act? Obama was so quick to jump into the fray of the Trayvon Martin murder case and the Cambrige, MA police incident, yet not the attacks on US Embassy’s and murdering of US citizens? Barack Obama should be in front of the American people yesterday denouncing this. But of course Obama is leading from behind and truly showing his smallness as the incredible shirking President needs to focus poll in order to find the right words. A note to President Obama, this was an act of war … stay home today and off the campaign trail and pretend that you are the President of the United States. Instead what came as a response for the US, a State Department disgraceful apology that the Obama WH is trying to distance itself from. So who is to blame for the ill-advised apology, President Barack Obama or Sec. of State Hillary Clinton? Some one has to be to blame or is now one in charge? Given that America’s most senior representative in Libya appears to have been killed – with some reports suggesting that three other staff also died – Mr Obama’s response will have to be far tougher. Sorry Mr. President but you are going to have to do a lot more than simply offer your outrage and condemning the killings. It was originally reported that the killings were a result of a rocket attack. However, some are now reporting that Ambassador Stevens died of suffocation and the other three embassy workers of gun shot wounds. The Americans were targeted in an attack in their car, trying to move to a safer venue away from the violent protests that erupted at the U.S. Consulate, Reuters reported. Stevens died of suffocation, while the three other personnel were killed by gunshot wounds, CBS News reports. This was the first U.S. ambassador to be killed in the line of duty since 1979. Guess who was President then? My how the similarities of Jimmy Carter and Barack Obama are just uncanny. How in the hell does Barack Obama not stay in Washington, DC and act like the President as the Middle East burns? Instead, its campaigning as usual. Breaking News from Lybia … Deposed Libyan leader Muammar Gaddafi (Kadaffi) Captured!!! 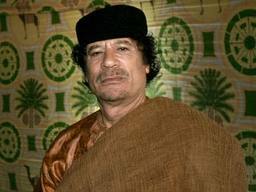 As reported by Reuters, the deposed Libyan leader Muammar Gaddafi (Kaddafi) has been captured near his home town of Sirte. The mad dog of Lybia has been captured. Didn’t Muammar say he would not go down without a fight? It is being reported that Gaddafi was shot in both legs and conflicting stories that his injuries may be fatal. (Reuters) - Deposed Libyan leader Muammar Gaddafi was captured and wounded near his hometown of Sirte at dawn on Thursday as he tried to flee in a convoy which NATO warplanes attacked, National Transitional Council official Abdel Majid said on Thursday. UPDATE I: From the BBC, Anti-Gaddafi forces take Sirte …and capture Gaddafi. Libya’s transitional government forces have taken full control of Sirte, the last city where Gaddafi loyalists had remained holed up, fighters and reporters say. Soldiers hoisted the new NTC national flag on buildings in the centre of Col Muammar Gaddafi’s hometown. Unconfirmed reports quote officials as saying Col Gaddafi was captured there. UPDATE II: Reuters now reporting that Gaddafi was KILLED!!! According to Reuters, Gaddahi has died from wounds sustained in his capture earlier today. According to many reports HERE and HERE, Muammar Gaddafi won’t be down for breakfast. Good riddance to bad rubbish. UPDATE III: The UK Telegraph has a pic of a mortally wounded Gaddafi.